Meet Jessie, Skimble‘s latest featured Trainer! This Oregonian turned her passion for rowing into a career when she started her own traveling gym. We recently had the chance to catch up with Jessie Swaner and learn more about what motivates her to give back to her clients and the local community. Jessie: I could swim before I could walk. I have two very athletic parents and it was really important for them to raise kids who played sports. I played soccer, swam, and was into horseback riding when I was younger. I swam competitively up until college and then switched to rowing. When I started rowing, I instantly fell in love with it. I always loved swimming, but not the way I love rowing. Jessie: It was my love for sports that led me to become a personal trainer. I was in my early 20’s when I decided I wanted to get certified as a personal trainer to help people. I also have my Bachelors degree in Community Health Education, so as you can see health has always been really important to me. My background in Community Health Education gave me the skills and tools I needed to help communities become healthier and happier. What is Rowology and how did it all begin? Jessie: It was my love for rowing that inspired Rowology. Rowology is the personal training business I started in Oregon. I focus most of my training around the rowing machine because I love it, and because most people don’t know what a great workout rowing can be. Rowing uses the whole body and builds muscles. I hope to open a gym that focuses on group training around the rowing machine; an interval style class where athletes can row, lift weights, then row again. That’s the dream! Jessie: I first came upon Workout Trainer when I was researching workout apps. There are so many different types of workout apps out there, but there aren’t many with a comprehensive platform like Workout Trainer. It has the community, the workouts, and professional knowledge that both athletes and fitness enthusiasts need. How do you use Workout Trainer as a part of your personal life and/or coaching business? Jessie: Even though I’m a personal trainer, 98% of the time I use Workout Trainer when I’m at the gym working out myself. There are so many different workouts that it makes my weekly fitness planning easier. And I have the luxury of adding my own personal ones too, which is great because other users get to see what myself or other personal trainers are doing, and even try some of my workouts. What helps you stay motivated to train? Jessie: Music is what keeps me motivated to stay fit. I love listening to music! There are different genres I listen to for different types of workouts I’m doing. I usually listen to classical music when I’m doing yoga, rap when I’m lifting weights, and dance music when I’m rowing. Jessie: I know this isn’t a secret, but a lot of people don’t realize the importance of doing push-pull style workouts. Whether you are focusing on back or arms, it’s important that you do a push exercise with a pull, or focus on just pull or push for the day. 1) It really helps you focus on a workout routine 2) It allows the body to recover, and burn fat. It’s crucial to let the body recover, and who doesn’t want to burn more fat?! Thanks for sharing with us, Jessie, we’re excited to see what the future brings for you and Rowology! Want to follow Jessie and other great trainers? 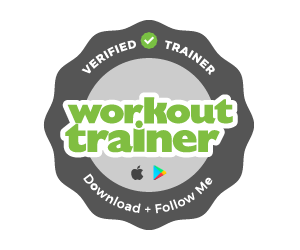 Download the Workout Trainer app for Android & iOS, then head on over to the new Trainers tab. Are you a fitness professional? 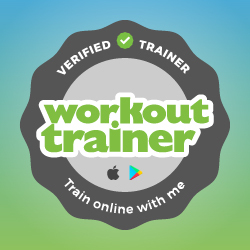 Want to become a Verified Trainer like Jessie and have access to free coaching tools and more? Get started on Skimble’s Trainer page. Meet Michael, Skimble‘s latest featured Trainer! This Midwestern boy has done it all, from growing up wrestling in his small Missouri hometown, to rock climbing in some of the most spectacular places around the world. We recently had the chance to catch up with Michael Butts in Boulder, Colorado and find out more about his latest passion; CrossFit. Tell us a bit about your fitness background? Michael: I grew up in the small town of Carthage, Missouri in the Ozarks. Growing up with boundless energy and the last name Butts, my brother and I got into quite a few scuffles as children. So one day my father decided to take us to wrestling practice. As it turned out, I was pretty good at the sport. Good enough to earn a full ride scholarship to the University of Nebraska in Omaha. For those of you who are not familiar with the sport of wrestling, there is a fair amount of weight loss involved. From a young age I was lucky to learn from some of the best in the business, Olympic champions and coaches from around the world. They taught me how to train and the importance of nutrition if I wanted to perform and compete at the highest level. Those lessons in training, nutrition and performance have stayed with me over the years. I am dedicated to the pursuit of fitness, healthy living and helping others get there too. Rumor has it you’ve traveled a lot in the name of fitness! Where have you lived and trained? Do you have a favorite location? Michael: After college, I discovered rock climbing and spent 9 years climbing around the world. I climbed in over a dozen countries, pushing myself mentally and physically on some of the best rock climbs and mountains around the world. During my travels I was exposed to almost everything the fitness world has to offer. Gripped by the desire to find new challenges, I discovered CrossFit in 2008. After only a few workouts I knew that CrossFit was going to be more than just a training element in my life. Some of my most memorable workouts have been in remote places around the world with amazing people. Michael: My favorite workout style is Olympic weightlifting combined with mid-level track & field and a little gymnastics. I believe these are the strongest, fastest, healthiest athletes on the planet and by combining these modalities I can create a great workout that keeps me mobile, strong and powerful. Speaking of Olympic weightlifting, you have competed in that field. Can you share any highlights? Michael: Yes, I have competed in several local competitions. One highlight was a 315 pound Clean and Jerk (a 10 # personal record) for a win. What do you eat? Do you have a guilty pleasure? Do you supplement? What do you take? Michael: I try to eat as much food as possible. I want to get my nutrients the natural way, from food. My favorite post workout recovery is an 8oz chocolate milk, giving me just enough protein and simple sugars to ensure protein synthesis, helping my muscles grow. Do you have a personal mantra or message you stand by? Michael: “If it doesn’t challenge you it doesn’t change you.” Above all, I believe that fitness is non-negotiable. In life the ability or inability to meet physical challenges shapes an individual’s personality and lifestyle, be it moving luggage to the overhead bin, climbing stairs at work or hiking a 14’er. I believe in a world filled with confidence and strength, I’m dedicated to the pursuit of fitness, healthy living and helping others get there too. Thanks for sharing with us, Michael, we’re looking forward to our next climbing session together! Meet David, Skimble’s latest featured Trainer! David is a nationally certified Personal Trainer with a B.S. in Sports Medicine and Athletic Training. This Georgia Fitness Coach developed a strong drive to help people after undergoing his own 80 lbs drop – talk about dedication! We recently had the chance to chat with David Rivera about his personal fitness journey and how he uses Workout Trainer to help others achieve their goals. Tell us a bit about your shift from Athletic Coach to Personal Trainer? David: I was an Athletic Trainer for various Sports Medicine Programs at High School, College, and Amateur/Semi-Pro level for over 10 years. Within that time I neglected my own fitness and no longer represented the knowledge and discipline I promoted. I took a step back to make lifestyle and priority changes that would allow me to find a healthy balance. After my own transformation of going from 250 lbs to 170 lbs for my first Half Ironman, I chose to become a Personal Trainer and Fitness Coach. I knew I was able to relate to individuals struggling to find a balance in life, work, family, etc. I felt compelled to help others as my educational background prepared me to not only rehabilitate athletes back from injury, but to assist individuals with any physical limitations to successfully attain their personal goals. Having undergone such a big transformation yourself, what keeps you motivated to stay fit? David: Feeding off the energy of other like minded individuals as we all grind through our struggles, but strive to be our best every day. What’s your own favorite workout style? David: I have evolved from triathlon and endurance training as a focal point and am now enjoying powerlifting. My favorite workouts are the Leg Blaster and Powerlifting Chest workout. I’m also dabbling in weightlifting at the moment, I like taking on new challenges. How has Workout Trainer helped you build your coaching business? David: It’s been a fantastic way to stay in contact with my clients, send workouts if schedule conflicts arise, and give feedback for improvements. I can now provide one-on-one coaching from anywhere. The workouts are great for my clients to cross-train when out of town or on vacation. As the Skimble community grows, it’s become a great place to feed off the incredible energy and motivation shared throughout. We’re so happy to hear that! Do you have a favorite feature in the app? David: My favorite features are the playback and audio cues that accompany the exercises. They make it easy for my clients to do workouts when I’m not with them in person for guidance and coaching. Thanks for sharing with us, David, and make sure to check out our new 1:1 Training Tools in the latest app update! Want to follow David and other great trainers? Download the Workout Trainer app for Android & iOS, then head on over to the new Trainers tab. Are you a fitness professional? Want to become a Verified Trainer like David and have access to free coaching tools and more? Get started on Skimble’s Trainer page. Meet Tif, Workout Trainer‘s latest featured Verified Trainer! On a mission to change the world’s attitude towards exercise one smile at a time. This local San Francisco fitness fanatic has the kind of positive spirit that’s contagious, you can’t help but get up and join in. We recently had the chance to chat with Tif Sippel about her fun workout style and how she uses Workout Trainer to inspire and motivate others to join the fitness movement. Q 1. Tell us a bit about your background and how you initially got involved in fitness? Q 2. What’s your favorite workout style? Tif: Being surrounded by fitness every day can make any workout method get old really quick. There is something to be said about specializing, but there is also something to be said about keeping it varied and mixing things up. I myself live by the latter! While there are certain things that will always be a foundation for me (joint mobility and strength, dance, being upside down) everything else goes through cycles. Olympic Lifting, Kettlebells, TRX, Parkour, Surfing, Acrobatics, Rowing, Plyometrics, Cycling, Hiking, Trail Running, Barre….the list goes on. No “fitness method” is off limits for me. Q 3. How does Workout Trainer help you as a fitness professional? Tif: It’s a great way to get my clients to work out when they go out of town. I also like creating a workout in the app after I’ve done a killer workout that I think the world should know about. It’s a way of documenting a workout that I may forget down the road and can refer to later to see where I’m at with my fitness level. Another thing I love about the app is that it gives me a chance to see what a larger population of fitness goers are into. I live in San Francisco where fitness is a big part of a lot of people’s lives. We live in a “fitness bubble” and it’s great to see what people naturally gravitate to in the app. Q 4. Wonderful to hear! Do you have a favorite feature in the app? Tif: I love the ability to communicate with people around the world about workouts and interact with Skimble community posts. I don’t ever want to take for granted how technology gives us the ability to connect with people everywhere. It’s so great to have this global knowledge and insight, especially as a professional in the fitness industry. Q 5. What keeps you motivated to stay fit yourself? Tif: Honestly, there is this little guy in my head who tells me that because I am a representative of the fitness industry it would be a good idea to stay fit. And by “stay fit” I mean “be fit” not “look fit”. That’s a whole other conversation I won’t get into now. More importantly and on a larger scale, what keeps me motivated to stay fit is the addiction I have to moving my body and the results I get from following through. It gives me confidence, puts my mind at ease, allows me the opportunity to do something for myself and hang out with friends. It makes my life more fulfilled and that is definitely something I love about fitness. Tif: Don’t do it if you hate it. It may not seem like a secret but time and time again I hear people say how much they hate going to the gym or going on that run, etc. If you hate it, you’ll end up loathing it and you’ll never want to do it again. Take the time to find something that makes you tick. Maybe it’s joining a team sport, hiking, chasing your dog, playing on a playground, dedicating yourself to learn a trick. I’ll also add to that, that sometimes people don’t want to move because something hurts or they’re so mentally drained that they don’t have the energy. Most of the time people don’t even realize that this is the case because it’s discarded as laziness. In that case, I usually suggest to try and see a professional or specialist about it. It could be a medical professional, a life coach, a professional organizer, a house cleaner; the diagnosis is up to you and what’s happening in your life. The body wants to move, we just need to find a way that it likes to. Thanks for sharing with us, Tif, and keep up the positive vibes! Want to follow Tif and other great trainers? Download the Workout Trainer app for Android & iOS, then head on over to the new Trainers tab. Are you a fitness professional? 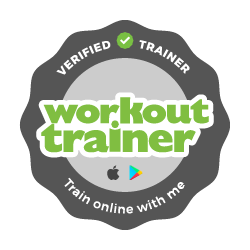 Want to become a Verified Trainer like Tif, and have access to free coaching tools and more? Get started on Skimble’s Trainer page. Meet Andy, Workout Trainer‘s latest featured Verified Trainer! This East Coaster from Connecticut became inspired to help people after going through his own weight loss journey in college. Andy O’neill turned his passion into his profession as a full-time fitness coach and has helped hundreds of people reach their fitness goals, whatever they may be. We recently had the chance to chat with Andy about his fitness journey and how he uses Workout Trainer to inspire and motivate his clients to reach their own goals. Andy: It all started when I was an overweight college student with a bum knee, studying physical therapy. After a few years, something hit me. I realized I was unhappy, miserable, and really needed to get my life under control. Thanks to my studies, I worked on my knee vigorously until I could walk without a limp again, then eventually figured, why stop there? I took up running and lifting, studied fitness and nutrition for fun, then next thing I know, I dropped 108lbs! I was so excited! In that time, I found where my passion truly was. I ended up leaving college after I got my Bachelor’s Degree in physical therapy and got multiple certifications to become a fitness professional. I couldn’t be happier now! Andy: I like to pair up full body movements. I usually start with a sprint variation or heavy lift for lower body, followed by an upper body push, upper body pull, and a core stability movement usually involving rotation. Repeat that cycle 3 times then move on to the next set of 4 exercises. I usually do 3-4 rounds of exercises. Andy: The app is great for communicating with potential clients and is a huge source of information with the forums. It’s also a useful way to give people a sample of some of your workouts and build interest. I love it! Q 4. That’s great! What’s your favorite feature in the app? Andy: My favorite feature is being able to add my own exercises. It keeps us trainers from being limited by the library of exercises already in the app and allows me to get creative. Andy: My family and clients are my biggest motivation. Everything I do, I do for them. I can’t expect anyone to push themselves unless I am willing to do the same to myself. It just wouldn’t be right! Quick and simple to follow! Follow your process and you WILL arrive at the result you want. Thanks for sharing with us, Andy, and keep showing us how it’s done! Want to follow Andy and other great trainers? Download the Workout Trainer app for Android & iOS, then head on over to the new Trainers tab! Are you a fitness professional? Want to become a Verified Trainer like Andy, and have access to free coaching tools and more? Get started on Skimble’s Trainer page.